Is Running Your Company Like Riding a Bicycle? I remember well the first time I rode a bike. Or, rather, tried to ride a bike. The initial excitement and confidence (“I can do that, it looks so easy”) soon followed by an almost immobilizing fear that froze me in place. This was before the scrapes and bruises that come with learning a new skill and long before being comfortable enough to venture more than a few feet from my driveway without fear of falling. It was the early sixties, if I’m not mistaken. On that day my Dad decided it was time for the training wheels to come off. I don’t know if he had planned this special event, if it had somehow been ordained months, or even years, back as “the day”. Or perhaps the decision was more spontaneous than that. In any case, it was a momentous time for me, a day filled with excitement (after all, I was joining the ranks of the “big kids”). My recollection is that I may have been one of the last kids in my Atlanta neighborhood to make this “coming of age” transition. But I was confident at first. After all, it looked easy enough. And when that day came, Dad carefully balanced me on the seat and pushed me forward, his right hand gripping the back of the seat to help me maintain my balance. He followed me along in this fashion, not letting go. Until, at some point, he let go … and I would inevitably start to wobble and then fall. It was a lot harder than I had expected. This went on for awhile until, one time, he let go and I didn’t fall. Wow, still upright, very unsure of myself but riding on my own nevertheless. I was careful to attend to every move, to watch every rut and rock in the road, lest I lose my balance and fall, which still occasionally happened. For awhile, even after I realized I knew what I was doing, I had to be on my guard. Then one day the realization came that there wasn’t a need to pay so such attention anymore. I had “mastered” the skill of bike riding to the extent that it just came naturally. You know this didn’t happen overnight. Rather, the change was so gradual that I was not even aware of that “crossing over” point until after it had happened. Does this sound familiar? I imagine that most of us can recall a similar experience from our childhood. As with learning to ride a bike, these four stages may be applied to the learning and development process in any organization or business. The learning process begins in stage 1 (“unconscious incompetence”). We don’t know what we don’t know. If you’ve never ridden a bike, it looks easy. Double entry accounting seemed logical and should have been a piece of cake … until I first attempted to master it. I thought I understood the nuances of my target market… before I didn’t. And the list goes on. Then as we progress to stage 2 (“conscious incompetence”), the awareness of how little we know, or how deficient our skills are, becomes evident. Not only to us, but to those around us. This is a vital stage in the learning process. It’s here that mistakes are important, an integral part of the process, for it is through mistakes that we learn. It was through falling down repeatedly that I finally learned to maintain my balance. It took a few false starts, and the metaphorical scrapes and bruises that ensued, before I realized how little I knew about my ability to differentiate against my competition. By learning to ride without falling or developing an understanding of our target market, we enter stage 3 (“conscious competence”). Conscious of the fact that we finally understand the skills or procedures that show our mastery. Still attentive to what we’re doing, ever mindful of every rut or rock in the road, every slip of the hand or lapse of concentration that could throw us off. In business, this is the point where confidence begins to grow to the extent that we really begin to feel we know what we’re doing, but we still have to focus, we have to be on our game. 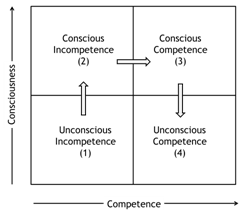 The ostensible ultimate goal in Gordon’s learning model is stage 4 (“unconscious competence”). That’s when things come so naturally that what we are doing doesn’t require thinking. Often people say things like “I could do this in my sleep” or “I know that like the back of my hand”. This is the learning stage that so many strive to attain. Professionals are recognized when they have mastered knowledge and skills to the extent that it appears to come naturally. But what if stage 4 is a very dangerous place to be? That’s why I used the word “ostensible”. My contention is that in business, unless you have the awareness to identify and understand the potential pitfalls that accompany “unconscious competence”, you are in danger. While it’s good for things to “come naturally” to us, we can run the risk of going into autopilot and losing awareness of our surroundings … at which point the learning process ends. It’s easy to forget that we are living in a constantly changing world, fraught with unexpected events and curves that come when they are least expected. Not only has this happened to clients over the years, I’ve lived through it in my own businesses. Let’s return briefly to the biking analogy. Professional bikers are acutely aware of the pitfalls of stage 4. They know that even though considerable skills now come naturally, if they are not constantly aware of every rut and rock in the road, of the competitor mere inches off their rear wheel, of the way the handlebar is gripped or the pressure on the pedals, if they rely too much on “muscle memory”, there is the risk of a catastrophic accident. True professionals vacillate between stages 4 and 3, constantly pushing back into 3 when things are too comfortable or when riding becomes rote. They rely on stage 3 to look for new ways to get an advantage over their competition. And so it is in business. Running a business without going back to the Conscious Competence stage, and even to the Conscious Incompetence stage, on a periodic basis is a recipe for eventual failure. You can go for a long time and survive, then out of nowhere a crash occurs. As we constantly look for better ways to improve our core competencies, there must be a constant awareness of the changes around us. If things come too naturally we will lose our edge. Years ago, I worked with a company that had fallen into the trap of Unconscious Competence. They were very good at what they did, so good that things just came naturally. Substantial financial rewards had happened frequently, and as a result management had become complacent. People were working from rote, from “muscle memory”. The problem was that as most of the company operated on autopilot, the market and competitive landscape changed around them. In order to survive, they had to adapt. Movement back and forth between stages 4 and 3 and 2 is a form of incremental learning and development. It is vitally important to the success of a business. However, there are times when incremental change is not enough and a major change in the development process is the only way to success. This happens when we complete the conscious competence cycle and move from stage 4 back to stage 1, when we get out of our comfort zone, venture into unknown territory, and learn radically new things. More about this at another time.